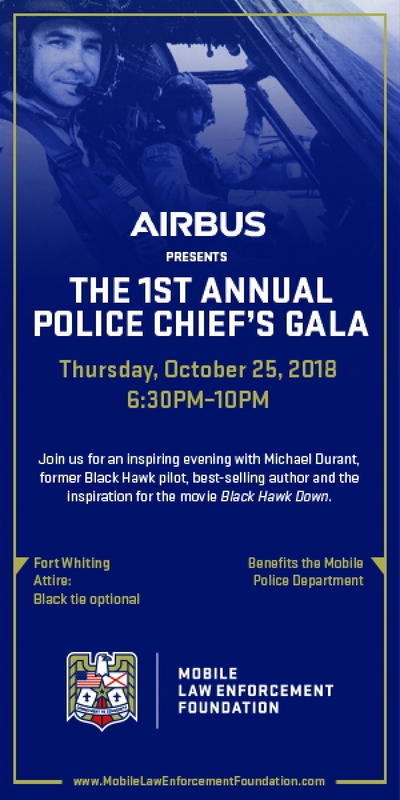 The Mobile Law Enforcement Foundation is hosting the Inaugural Police Chief’s Gala as its first-time grand social event to raise funds for the Mobile Police Department. The theme for the 2018 event, proudly presented by Airbus, is “In the Company of Heroes.” The gala, which will be held at Fort Whiting on Thursday, Oct. 25 at 6:30 p.m., will feature a master pilot, a showcase of Mobile’s best restaurants’ culinary delights, and musical entertainment. Funds raised from the gala will support Mobile Police Department’s programs, namely Bridging the Gap, Second Chance or Else (SCORE), the Gang Resistance Education and Training (G.R.E.A.T.) program, and Project THRIVE (Trauma Healing and Resiliency in the Wake of Violent Events). The monies will also be used to purchase specialty equipment, provide recruitment and retention incentives, and support the police department’s community engagement events. “A patriotic evening event such as the gala is a giant step forward for the foundation to show our commitment to enhancing community safety,” said John Weichman, director and treasurer of the Mobile Law Enforcement Foundation. The Mobile Law Enforcement Foundation was established in 2007. Although efforts to raise money are year-round, the gala is its first major fundraising event. The idea was presented by a newly-formed board. “With the support of our Mobile citizens and businesses, we will welcome 500 guests who will experience an unforgettable evening at the gala,” Weichman added. The guest speaker is Michael Durant, former Black Hawk pilot, best-selling author and inspiration for the movie Black Hawk Down. Durant will speak about survival as a prisoner of war for 11 days in Somalia, and talk about the power of motivation, teamwork and leadership as it applies to personal and business success. Several of Mobile’s most popular restaurants will present their culinary skills. They include Briquettes, Carrabba’s Italian Grill, Chuck’s Fish, El Papi, 5, Meat Boss, Olive Garden, Southern National, Stevie’s Kitchen, Walk-On’s Bistreaux & Bar, Wintzell’s Oyster House and Renaissance Mobile Riverview Plaza Hotel. There will also be a host bar. News anchor Bob Grip of WALA-TV Fox 10 is the emcee. Musical entertainment will be provided by Bobby Ohler’s Harbor Trio Band from New Orleans. A silent auction will complete the event. Tickets are $75 per person and may be purchased at any Hancock Whitney Bank and Synovus Bank. To reserve a table, or to inquire about sponsorships, call 251-208-1947 or email john.weichman@cityofmobile.org. The Mobile Law Enforcement Foundation is a nonprofit public charity and tax-deductible entity. To learn more about the foundation, visit mobilelawenforcementfoundation.com.